Sometimes traditions take root because they’re the most effective and efficient way of doing things. But how can you move ahead if you are stuck on a wheel of repeating the same old systems? In short: you can’t. 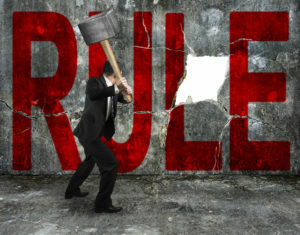 There’s a real benefit to becoming a rule-breaker, especially when it comes to breaking business rules. Here are a few ways you can grow your small business by stripping yourself of old habits in exchange for new systems and strategies. Innovation has never happened by repeating past behaviors. Hitting rinse and repeat, and falling into the comfort zone of old habits isn’t a way forward; it’s a way to stay still. Although it can feel awkward, there’s a way to continue your forward momentum (or start pushing ahead again after staying stagnant for too long). It requires you to transform yourself, your team, and your entire company culture into agents of change. It demands that you think outside of the box. It means that you push aside traditional ways of doing things in exchange for a fresh approach that could be more efficient and more productive. It sounds overwhelming, but it doesn’t have to be. Look at something as commonplace as setting your team’s schedule every week. Are you still taking the same approach you’ve been taking for years? If you’re buried in paper piles and red pencil marks, try using an app to make updates instead. Small changes like this can propel your business forward and set the tone for creative thinking in other areas of your company. What happens when you do things differently? People take notice and you suddenly have something unique to contribute to the conversation. Too many businesses speak at their consumers; few businesses speak with them. By changing your approach and dropping traditional business rules, you suddenly have a compelling story to tell that will add value to the greater marketplace. This makes it easier and more exciting to talk about you. Few people remember the “me too” brands. It’s easy to forget the companies that put on the same song and dance in every commercial, blending in with their competition. If you want to be remembered, you have to break away from the ordinary and start using nontraditional approaches to reach your consumers. These are the companies that get remembered—not the ones that blend into the background, hiding behind the same-old approach to attracting business. When you drop a few of the outdated rules from your small business, you end up welcoming a diverse way of thinking about how to build your company and whom to work with. If creating a more diverse workforce of people from all ages, backgrounds, and lifestyles is on your to-do list, it’s time to drop traditional in favor of a new approach. Why are you in business? Sure, you want to make money and add value for your customers, but what’s the bigger purpose? Think big as you answer this question. For example, if you sell pencils, is it to create a way for children to learn and thereby make the world a better place in future decades? Or, if you sell BPA-free water bottles, is it to encourage hikers to leave less of a footprint as they make their way through national forests? When you break traditional business rules, you’re better able to invest in the cause that got your organization going in the first place—and this is what being in business is all about. What are you doing to break free from tradition? Breaking free from traditional business rules isn’t always the appropriate approach to running a company. Start small and work your way up. Knock down old habits in favor of new ones. Some will fail; many will work. It’s about iterating, experimenting, and continuing to surge forward. This is the path to making your small business a success in your industry.